SLC Cache Sizes & SYSmark 2018 - The Western Digital WD Black SN750 SSD Review: Why Fix What Isn't Broken? 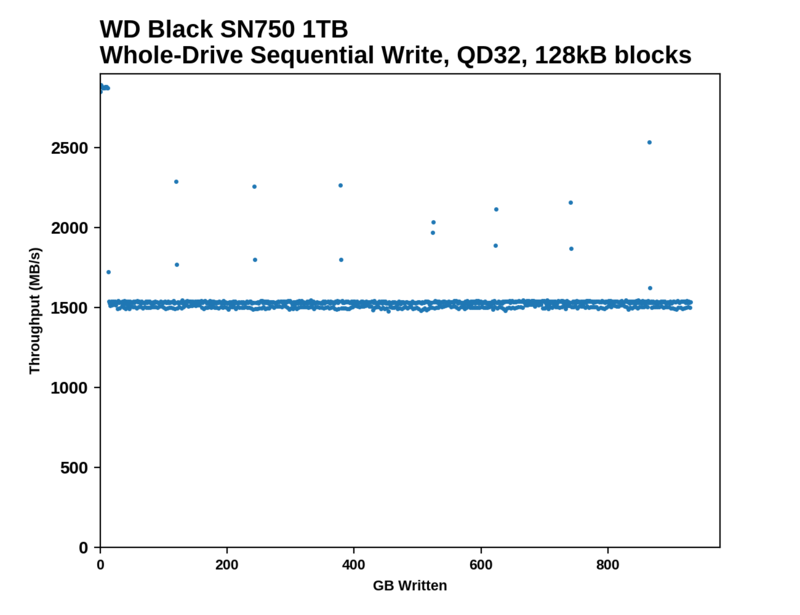 The WD Black SN750's behavior during a full drive write is quite similar to that of its predecessor, albeit with a 5% improvement in write speed after the SLC cache fills up. The cache fills after about 12GB of writes, but since performance after the drop is steady at around 1.5GB/s the small cache isn't really a problem. The WD Black SN750 offers best in class performance for long-duration sequential writes. After the SLC cache is full, the SN750 is about 5% faster than its predecessor for filling the rest of the drive. When looking at the total time to fill the drive, the SN750's advantage is slightly higher because its write speed to the SLC cache is also a bit faster. The new WD Black SN750 regresses slightly in performance on SYSmark 2018, primarily on the responsiveness test, which is the subscore that's most sensitive to storage performance. The SN750 still clearly outperforms the WD Blue SATA SSD but even managed to fall behind the first-generation WD Black that used planar TLC and a third-party controller. The WD Black SN750 turns in an excellent energy consumption score, lower than any drive in this bunch save for the WD Blue SATA SSD. Where do you see that they call it the top NVMe SSD? He didn't call it the top NVMe SSD, he said a "top NVMe SSD". In the second paragraph on the last page. "the new WD Black is still a very competitive high-end NVMe SSD"
I forgot to add, or rather point out, the 970 EVO and 970 PRO share the same controller and are otherwise identical configurations with the exception of the PRO being MLC. That said, Samsung actually rates them near-identically in performance and aside from the SLC caching algorithm, the EVO performs the same.